Shure has begun shipping two of its newest audio network interfaces, the ANIUSB-MATRIX and the ANI22. Originally announced at the Integrated Systems Europe (ISE) 2017 show in Amsterdam, the audio network interfaces are designed for use with Shure’s premium AV conferencing microphones. 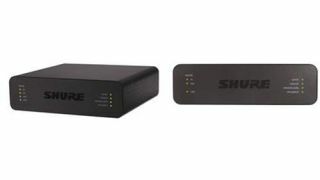 The ANIUSB-MATRIX and the ANI22 provide connectivity for Shure’s Microflex Advance and Microflex Wireless systems to integrate into existing AV/IT infrastructures. The ANIUSB-MATRIX connects four Microflex Advance or Microflex Wireless microphone channels via Dante to a room’s AV conferencing system or a PC-based soft codec through USB or analog. This is ideal when a high-end microphone is desired and acoustic echo cancellation of an AV conferencing codec will be used. Offered in XLR and BLOCK variants, the ANI22 can bring up to two line/mic signals into—or out of—a Dante network for audio routing and convenient browser-based remote control. The ANI22 features a compact form factor for easy mounting without an equipment rack, and Power-over-Ethernet (PoE) eliminates the need for an outboard power supply.